Anyone who knows me knows that I am literally as big a fan of The Muppets as they come. Ever since I used to get home from nursery as a 2/3 year old and watch Sesame Street at lunchtimes with my sister, to now where they’re mildly inconveniencing Jack Black and duetting with Olly Murs on X Factor, I have been a devoted fan, and virtually all their DVDs (well, except ‘Muppets from Space’, which wasn’t very good, let’s be real) are on my shelves in my bedroom. My allegiance to a favourite Muppet seems to change every other week – usually between Animal and Gonzo the Great. However, one Muppet for me somehow manages to stand tall above them all as a beacon of easy going, green normality in the madcap posse of bears, pigs, chickens and general weirdos. 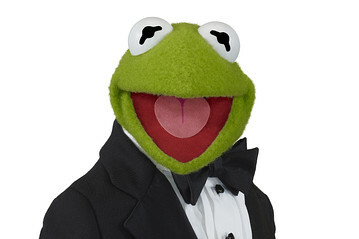 Yes, I am of course talking about the original Muppet, Kermit the Frog. This week, I happened upon a small piece he did, entitled ‘Note to Self’ for CBS News in the US. In it, he read out a note to his young ‘tadpole’ self, that was at one parts witty and twice as many parts eloquently and touchingly put. 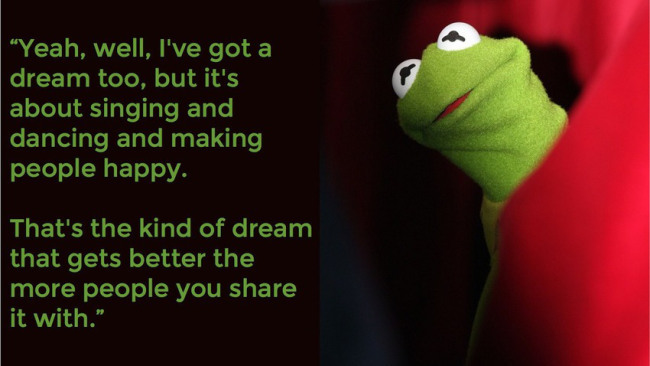 Even as far back as 1978’s first big screen debut ‘The Muppet Movie’, he seemed to have this impenetrable gift of expressing what following your dreams and your passion in life was really all about – the quote above from said movie being a perfect example – and at once making you forget he’s just a frog. Hello there. Yes, you! Hey! Listen, I know the new copy of Smash Hits is more interesting. But no one’s gonna run off with it in the next few minutes. Trust me, I know. And let’s be honest, your Geography homework that’s due tomorrow probably won’t do itself in that time either, and it won’t matter given you’ll get to dump it in two years’ time (exciting isn’t it?). Hope you’re sitting comfortably? Good. Then I’ll begin. As I’m to understand it, your life’s not exactly been easy in the last year, has it? I know you’re hoping things are going to get better this time after the year you endured. What I can tell you is that it will get better. It just won’t always be easy. But you’ll find the strength to fight your battles the older you get. People will soon see you as you always knew you were. You know Simon, your best friend who you do library duty with? Yes? Well, what I will say is stick with him. He’s a really cool guy, and you’re gonna experience so much together as friends. He’ll always listen to you unconditionally whatever the problem is. And he’ll introduce you to Tenacious D who are pretty bloody awesome. And you know Mrs Dimbleby, your learning assistant? Listen, I know things haven’t been easy, but she’s only doing the right thing by you. You may not see it now because you’re so desperate to be normal and fit in and be a carbon copy of everyone else, but she will be the greatest mentor you will ever have to go on and better yourself and prove your talents to the world. Make sure you show your appreciation for her. And hey – got to say, I like the new S Club 7 poster on your door. Rachel is rather delicious isn’t she? About that…I know you feel rather like it’s uncool to be a fan of theirs right now – at least, to your classmates who think they’re not cool, and who tease you about it. But don’t feel ashamed. It’s their music and TV show (and Rachel. Oh, Rachel…I’ll digress) that makes you happy and makes you smile when nothing else does, and as long as you’re happy, that’s all that matters. And you know how you really like English? Like, really like it? That’s OK too. This year, your English teacher is going to be an incredible lady called Diane Howes. She’s gonna have a more significant impact on your future and your path than you realise, and she’s going to invigorate your passion for the subject more than you thought possible. You won’t be into PE or football much still either, but that’s OK. Once you leave this place in another 5 years, you’ll find things you do enjoy that keep you active. As for popularity, and getting girlfriends, don’t worry about that now. You’ll make new friends along your future path who right now, don’t even know you exist but will be such a big part of your life. And what’s this…is this a book you’re writing? Looks good so far! Make sure you keep writing as well. That will go on to be one of the greatest gifts you give to others – family and friends alike. The pen and paper is your gift to the world. I’ll let you get back to this week’s Smash Hits now. Looks like an interesting issue this week. PS I made a cuppa for you *places it on your bedside coaster*. Keep smiling, stay cheeky, and be cool. ‹ PreviousThe art of a bucket list.